Absolute Temp Control | Serving Portland OR, Vancouver WA, and surrounding areas | 888-998-ABSOLUTE | Welcome to the comfort zone! Welcome To The Comfort Zone! We will help you stay comfortable year-round with ENERGY STAR® Heating and Cooling systems. Is your Heating and Cooling system old and inefficient? The average service life of a Heating and Cooling unit is around 15 years. Give us a call to evaluate your heating & cooling needs with a FREE In-Home Consultation and avoid costly repairs and high utility bills. We will help you stay comfortable year-round with ENERGY STAR® Heating and Cooling systems. Whether you are thinking to upgrade your Furnace, Heat Pump, Air Conditioner System or you need a complete Duct System Design, we are here to help you with all your Heating and Cooling needs. Here at ABSOLUTE TEMP CONTROL, you can rest assured that your new Heating and Cooling System will be the proper size and that it will be installed correctly. 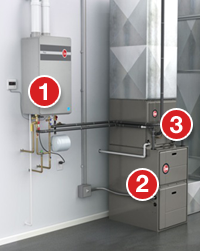 Choosing the correct size heating output is critical to getting the best efficiency, comfort, and lowest maintenance and operating costs over the life of the new system. Here in the Northwest, it makes sense to invest in the highest-efficiency heating system. High Efficiency Gas Furnace and A/C My wife and I want to thank you and your crew for the excellent job of installing my new Furnace and Air conditioner! The units are working perfectly and the work was done on schedule. Thanks for the great service, We will recommend you to all our friends whom are looking to upgrade in the future! High Efficiency Gas Furnace and Heat Pump System You fellows were just superb. The installation was amazing and the cold spots in our house are gone. Thank you for respecting our home, for protecting our floors and furnishings. You left our home cleaner than before and I can’t say that about previous experiences we have had in the past with other contractors. What a pleasure! You have a client for life. High Efficiency Gas Furnace, Air Conditioner, Whole House Filtration System It has been just about a month since you installed the new furnace and AC and I am so happy with the performance that I’m almost speechless. I guess having and old unit that was barely limping along set me up for this because you don’t really realize how bad it is performing until it is replaced with something that really works well. I want to say thanks so very much for everything you did here at my house from the process of selecting a replacement unit all the way to the clean and professional install (and really great sheet metal work – even the inspector was impressed). I generally have fairly low expectations when it comes to contractors but you changed that. Your work is/was outstanding and I couldn’t be happier with the results. I can’t wait for summer to test out the new AC unit! I’ll give you an update on the first 90 degree day. Thanks again for the rock solid professional job. I really appreciate it. Happy new year to you, your family and your crew! Daikin Ductless Heat Pump Model MXS32GVJU with one FTXS15LVJU and one FTXS18HVJU We are very pleased with the “feel” of the heat our new heat pump provides. Our most recent electric bill illustrates how effective this system is. Our average daily kWh usage for the period Jan 2012 was 90.9 and cost $9.96 per day. For the same Jan 2013 period our average daily kWh usage was 45.8 and cost 4.87 per day. Our consumption was cut in half. Our house is ALL electric ! The job took less than ONE day and our home was kept clean during the installation. My wife and I appreciated John’s professional manner of answering our questions and his technical skills. We would certainly recommend Absolute Temp Control for your new system !